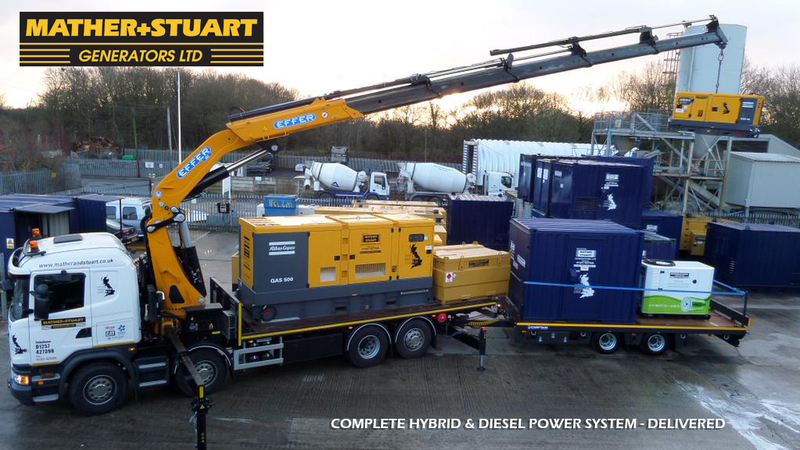 With over 30 Hybrid Power Generators (HPGs) in their UK fleet, Mather and Stuart is delighted to announce that they have opened a new depot in Scotland to cater for their successful growing group of Scottish customers. Mather and Stuart was established in 1982, prior to this, the founders were involved in major generation provision throughout Africa and the Middle East. Reliability has been the key to Mather and Stuart’s success. Their team of experienced staff are fully knowledgeable of the needs of their customers and are on hand 24 hours a day to answer customer calls. Firefly’s HPGs accompany their super silenced generator range of 10 kVA to 1250 kVA , which has earned a reputation for dependability under the most arduous conditions. Many customers of Mather and Stuart have benefitted from fuel and CO2 savings on site through hybrid power integration. Their experienced and qualified team can install and service a complete hybrid / diesel integrated power solution to achieve exceptional energy efficiency on site, whilst ensuring a robust, reliable and fuel-efficient power source. The Depot Manager is Scott Martin, who has a wealth of experience in the generator hire and sales industry. Scott is primarily in charge of the sales side of the operation and his father John Martin will deal with the servicing side. John has been in the industry for many years and is a very experienced engineer. Commenting on the opening of Mather and Stuart’s new depot, Michael Robbins, Head of UK Sales at Firefly said “it’s a pleasure working with Mather and Stuart, their experience and customer service speaks volumes about their success. Firefly is proud to have Mather and Stuart as a hire partner and we look forward to working with the team at their new depot”. To contact Mather and Stuart’s Scotland depot, call 01324 467222.